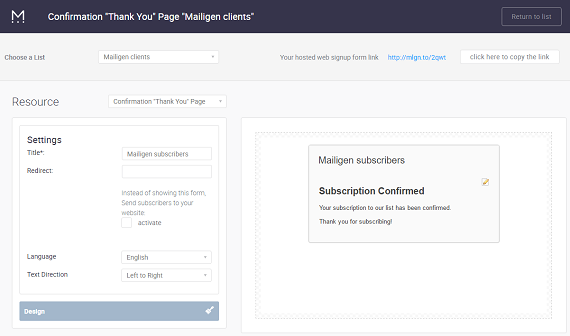 The Confirmation Thank You Page is displayed after users have clicked the link in the confirmation email. Next, select the Confirmation “Thank You” Page from the Resources Drop Down. After you have selected the Confirmation “Thank You” Page you can make changes to the behaviour or design of your page through the Resource Settings section or the Design Settings section. Title—the title of the page. By default, this will be the same title as the list. Redirect—a fully qualified URL to which to redirect the user instead of showing them the Thank You page. Note: You must activate the link by checking the appropriate box. If you fill out the field with a URL and fail to check the box, the user will not be redirected. DEACTIVATE automatic confirmation ''thank you'' email—check this box to prevent the automatic ''thank you'' confirmation email from being sent. Language—use the drop-down to select a language for the page. The WYSIWYG panel shows you a real-time representation of your form, email, or page as you are working on it. Changes you make to fields, labels, colors, sizes, images, etc. are reflected as you make them. 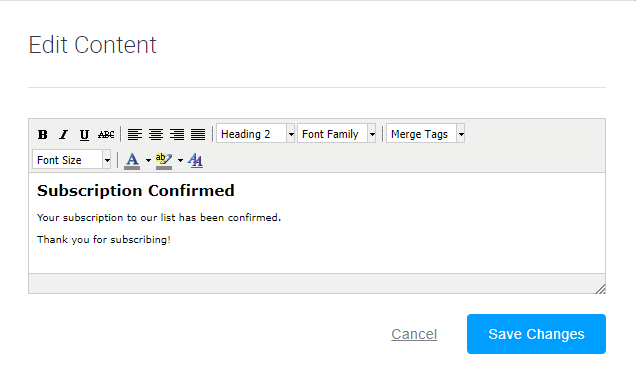 You can edit any of the text in the WYSIWYG panel of the confirmation “Thank you” page by clicking on the Edit Icon. This will open the Edit Content window. Even apply a customized CSS to highlighted text. When you are finished making changes to the text, you can click the Save Changes to commit them (which will close the window and return you to the Form and Email Design Wizard) or you can click the Cancel Link to cancel your changes and close the window. Note: You are limited to 300 characters of text.